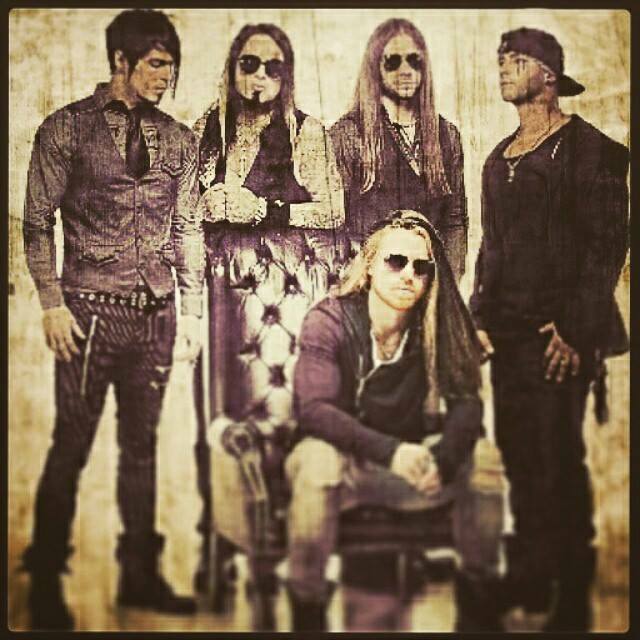 Emphatic is an American hard rock band from Omaha, Nebraska. Emphatic was founded in 2004 by songwriter and lead guitarist Justin McCain. The band released their debut self-titled EP in 2004. In 2005 Emphatic released a full-length self-titled studio album which included four tracks from the EP plus four new tracks. In the same year Emphatic signed with Universal, but never released any material under the label. In 2008 the band’s EP Goodbye Girl spent 17 weeks on the Billboard’s North West Central Top Heatseekers Chart. After Justin McCain met A&R executive, Jeff Blue, on a phone consultation, the two met in Nebraska to write their first song “Put Down The Drink”. The band signed to Jeff Blue’s Rock Shop Music Group in early 2009, Jeff and Justin wasted no time in getting to work on some new material. Jeff took the demo to various record labels, eventually Emphatic signed with Atlantic in December 2009 and the band inked a management deal with In De Goot Entertainment as well. Emphatic consisted of only three members up until that point, Justin McCain (songwriter, guitarist), Patrick Michael Wilson (vocalist) and Alan Larson (bassist). Justin and Patrick went into the studio to start recording their major label debut with multi-platinum producer Howard Benson. Josh Freese played the drums on the record and Paul Bushnell played the bass. After the record was completed the band brought in Lance Dowdle on guitar and Dylan Wood on drums. The band’s first studio album and major label debut “Damage” released on the 12th of July 2011. Emphatic was offered an opening slot on The Carnival of Madness Tour and unfortunately Patrick Wilson suffered a vocal injury (fractured larynx) which almost put the brakes on the project. Justin McCain was developing an Omaha-based rock band then, called “The Wreckage”, so he decided to pull vocalist Grant Joshua Kendrick from the project to fill in for Patrick. The band’s first single “Bounce” and the tour helped gather thousands of new fans and helped launch the second single “Get Paid”. After The Carnival of Madness tour, Emphatic had the opportunity to tour with Art of Dying, Adelitas Way and New Medicine with yet another new vocalist, Bryan Scott from Dev Electric. After that the band took a break due to Patrick not being fully recovered yet. During this time the band was featured on an episode of Criminal Minds with their song “Do I”, their cover of Quiet Riot’s”Metal Health”appeared on the Footloose (Deluxe version) and their version of The Corre’s theme song “End of Days” appeared on WWE. After 10 months Patrick Wilson finally returned along with a new drummer Patrick Mussack and hit the road to tour as support for Halestorm and New Medicine. Octane (active rock radio station) started playing the band’s third single off their debut album called “Put Down The Drink” which landed on the BIG UNS’ countdown and spent 4 weeks at No.1. 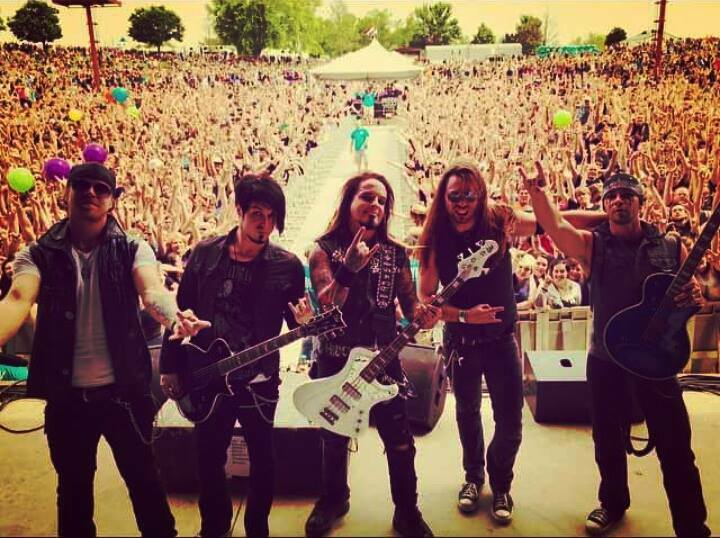 Halfway through the band’s tour with Halestorm Justin McCain found out that the label wasn’t going to pick up their next option on the contract. After the tour Patrick Wilson, Lance Dowdle and Alan Larson left the band. Justin McCain wanted to rebuild the band and contacted Toryn Green via Facebook, receiving a phone call from him an hour later. Toryn is the former frontman of platinum selling bands Fuel and Apocalyptica. Actor/musician Jesse Saint (Scum of the Earth/The Autumn Offering) joined the band as the new bass player and Bill Hudson of Cellador joined as the co-lead guitar player. Justin managed to land the band another record deal with Epochal Artist Records/Capitol and they started working on new material set to record in early 2013. Justin and Toryn joined forces creatively in the making of the record, both supplying songs from their own arsenal and contributing to creating new ones. The record includes collaborations with “Sahaj” Ticotin from Ra, Tommy Henriksen, Brian Vodinh of 10 Years, Bobby Huff, Tobin Esperance from Papa Roach and Johnny Andrews. After the tour Justin McCain announced that they had signed with Pavement Entertainment and a new album was in the works and would be due late 2014. Grant Kendrick was welcomed as an official member of the band after being a long-time touring band member on the band’s Facebook page. Justin revealed that the new album would feature guest appearances from artists such as Sahaj from Ra and Phil Anson from Venaculas, and a collaboration with Jonny Hetherington of Art of Dying. The label (Pavement Entertainment) appointed Justin as producer and the band is now recording at ARC studio in Omaha with the record set for release in early 2015. 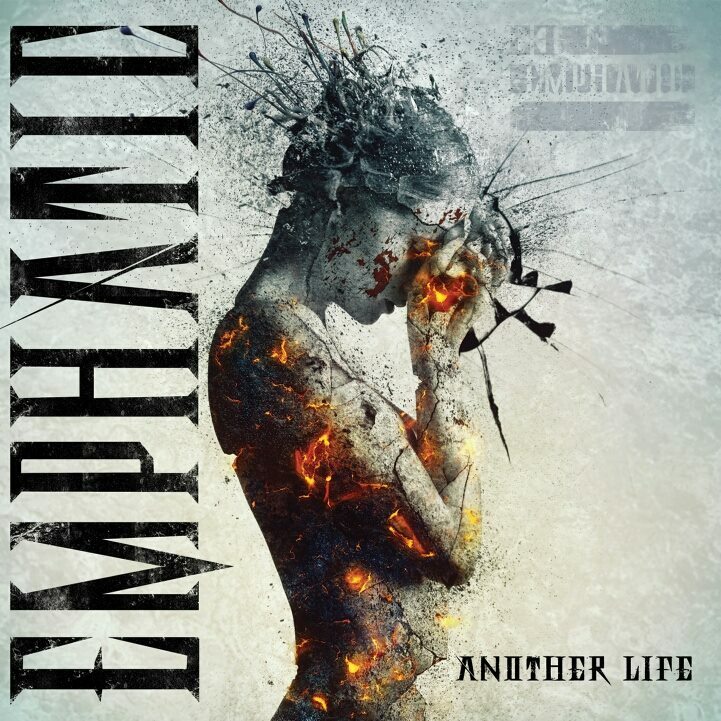 Emphatic has a unique blend of contemporary hard rock and grunge rock and I find that really appealing. I like the nostalgia that their music conjures within the listener, but it is tinged with a raw edge which is refreshing. 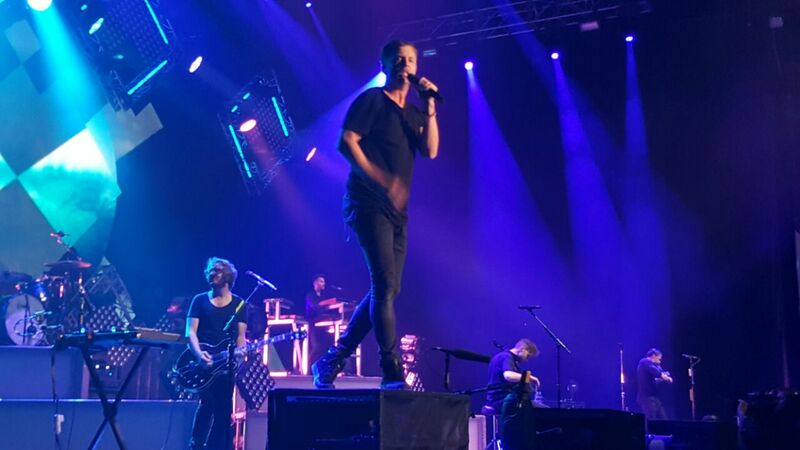 In November of 2014 I purchased Golden Circle tickets for One Republic’s concert on the 21.06.2015. There was no real build-up to the concert, because I had purchased the tickets so long ago. I normally do some research before a show, so I didn’t know what to expect which can sometimes be a good thing. 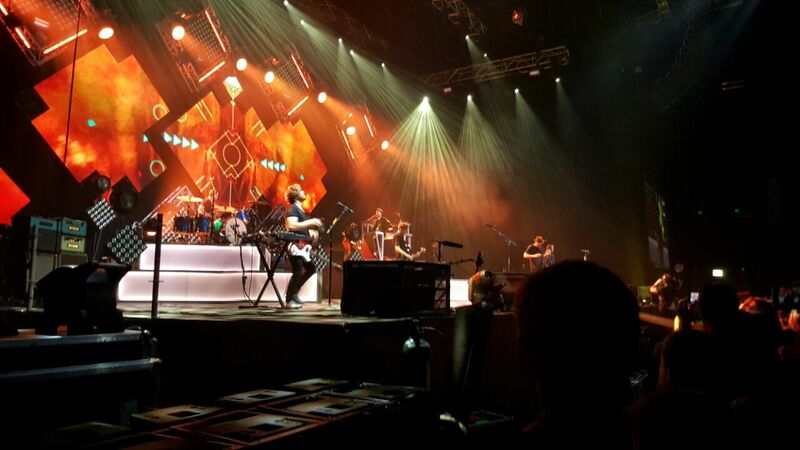 Gangs of Ballet was the support act for One Republic’s South African tour. The band started their set at 08:00 and performed their live staples such as “Hello Sweet World”, “Don’t Let Me Go” and “House and Money”. Gangs of Ballet hail from Durban and the band consists of Brad Klynsmith (Vocals/Electric Guitar), Jono Rich (Keyboard) and Josh Klynsmith (drums). All three musicians have studied Music at University level. Their sound is difficult to attribute to one genre, but they experiment with an eclectic mix of alternative, melodic, anthemic, electronic and dance music. Their musical influences include; Coldplay, Radiohead, Muse, The Killers, Civil Twilight and Isochronous. The band delivered a passionate performance, but I struggled to hear some of the vocals which might be due to where I was standing in front of the speakers which was very LOUD at times much to my delight! I was pleased that the support act was a well-known and experienced band, because it demonstrates the talent that South Africa can produce. 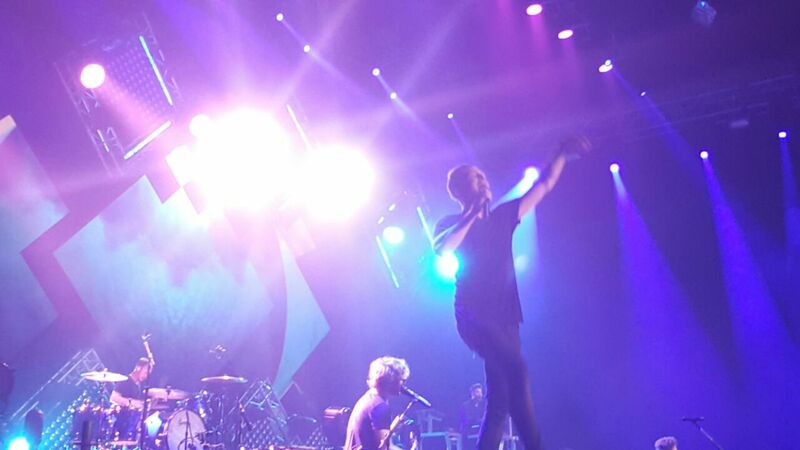 At 09:00 it was One Republic who finally took to the stage or so we thought?? We were treated to the band’s shadows behind a white sheet which really amped up the anticipation. They opened with “Don’t Look Down” and went straight into “Light It Up” which was fitting. As soon as the sheet came down the crowd went crazy and wholeheartedly sang along with “Secrets”. The band went off stage for a few minutes when the on-screen choir started singing the intro to “All The Right Moves”. 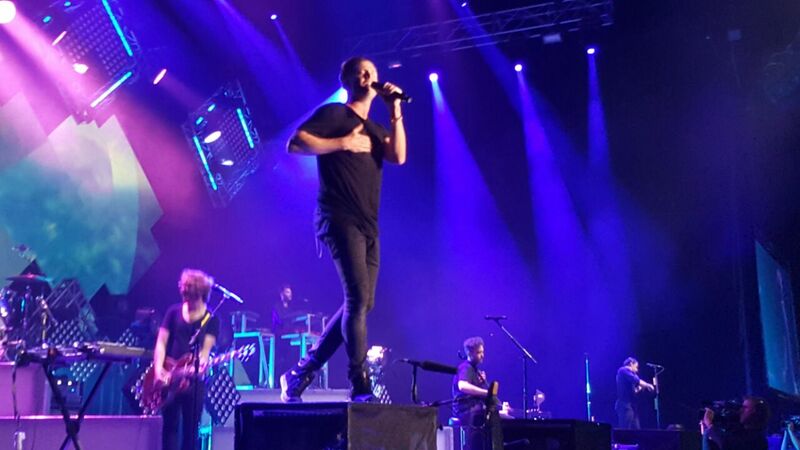 It was really remarkable the amount of variables evident on each song that One Republic produces and you only realise that once you see them play live. You tend to take it for granted when you are listening to their albums. 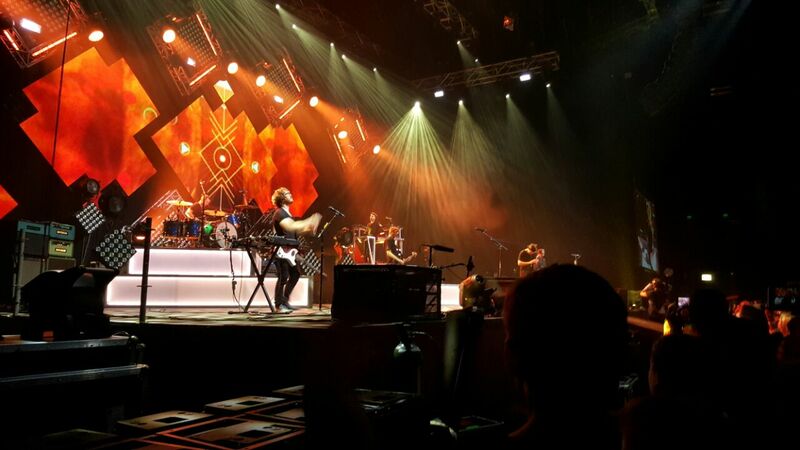 Each band member is capable of playing four instruments or more depending on the demands of each song, additionally they use their hands as instruments as well. They slowed it down with the song “What You Wanted” and played a crowd favourite followed called “Stop and Stare”. The popular song “Something I Need” didn’t disappoint at all. The band moved their set to the middle of the runway with a cool acoustic setting. 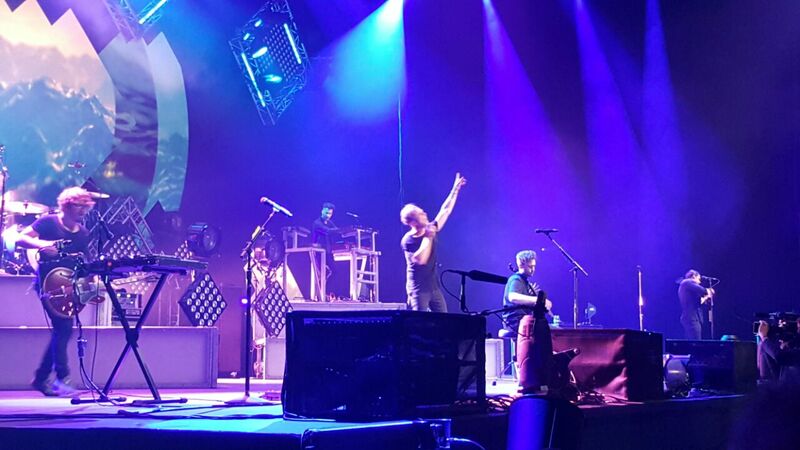 Ryan introduced “Apologize” on the piano to a very receptive crowd. A real treat was when Ryan did a cover of George Ezra’s “Budapest” with a twist. The band went on to play “Preacher” a really emotional song which will ring true to a lot of people, I was surprised how much I liked this song when I first heard it while listening to “Native”. 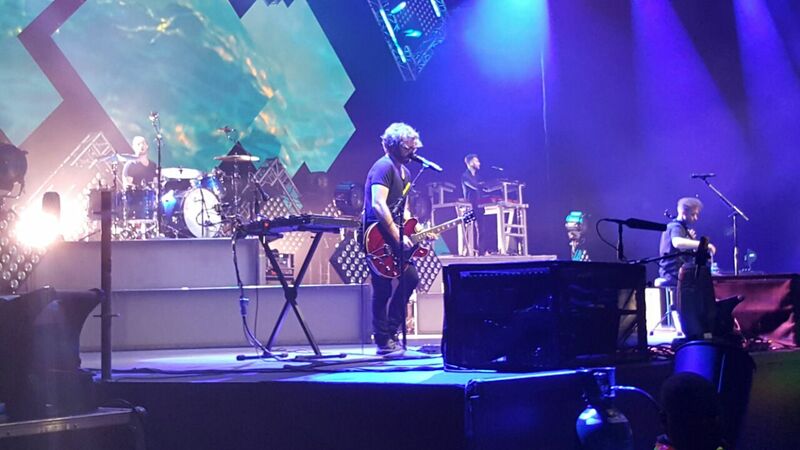 Next up was “Good Life” accompanied by imagery of the band and all their adventures during their world tour including the places that they visited. Among the shots were images of Cape Town which was a proud moment for all of us. The band went off stage except Zach Filkins who stayed behind, to treat us in playing witness to his extraordinary guitar skills with a Spanish guitar medley. It was jaw-dropping! The band re-entered to play “Counting Stars”, one of my favourite songs. They continued with “Can’t Stop”, “Au Revoir”, “Feel Again” and the current hit “I Lived” a very emotional song layered with a catchy melody. The encore started with the anthemic “Love Runs Out” during which Ryan came over to our side of the stage, looked me right in the eyes and took my hand, (*faints*) I don’t remember much after that 😀 . Ryan is a very energetic frontman affecting everyone around him and I was in awe of his exceptional vocal delivery which was on point the entire time! 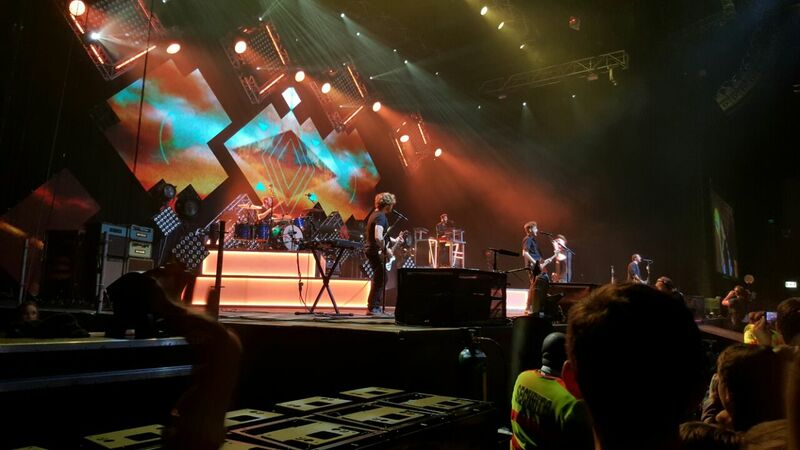 I really appreciate the production that went into setting up the venue and the ambience of the show. I can understand why I paid the asking price, which is really important for the band(s) and production team to take into account. As a concert goer you NEVER want to feel ripped off. 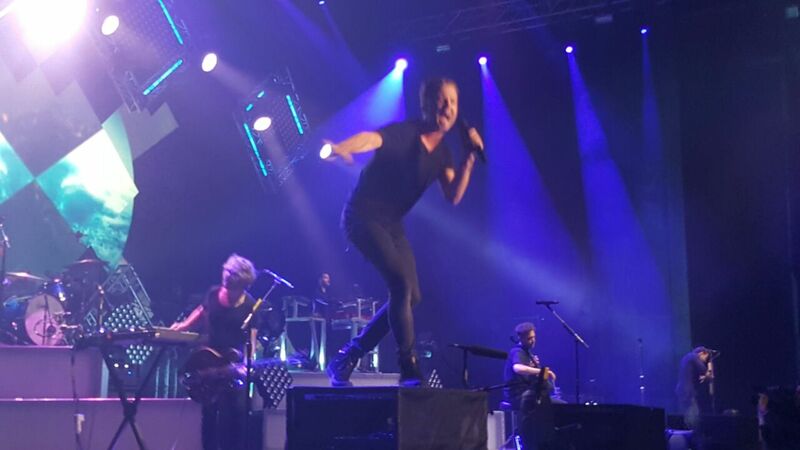 I had a fabulous time and I would love for the band return to South Africa ASAP. PS: Thank you to my fiance for all the photos and videos he took, so that I could just enjoy the show. 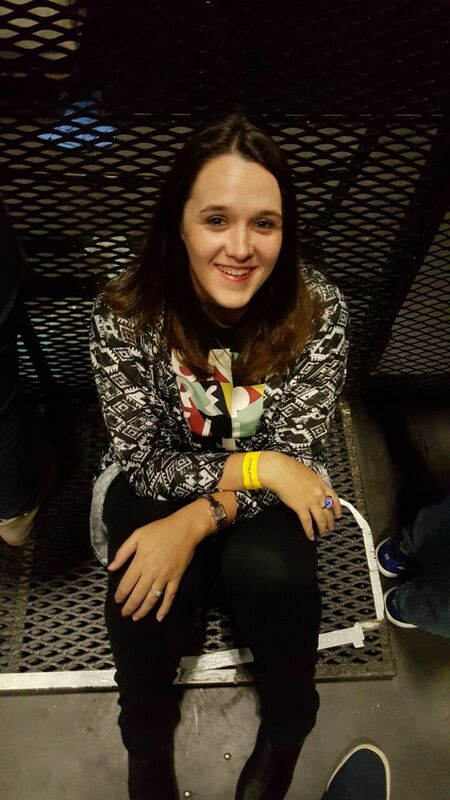 Me patiently waiting for the show to start!